Goose Grease specializes in hand-painted, custom wooden dolls made on fair trade doll bodies, hand-chiseled on an electric lathe in Bogotá, Colombia. Our dolls are brought to you without any intermediaries, having established a fair price per piece directly with our carpenter. Every doll is unique and has its own personality. 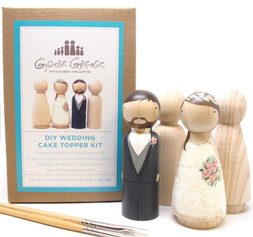 Along with personalizing wooden peg dolls to make family portraits or wedding cake toppers, we offer standard designs and DIY kits for the crafty ones out there. For any further questions, custom requests or wholesale orders, please contact us at info@goosegreaseshop.com. DIY Wedding Kit - Paint Your Own Wedding Cake Toppers.